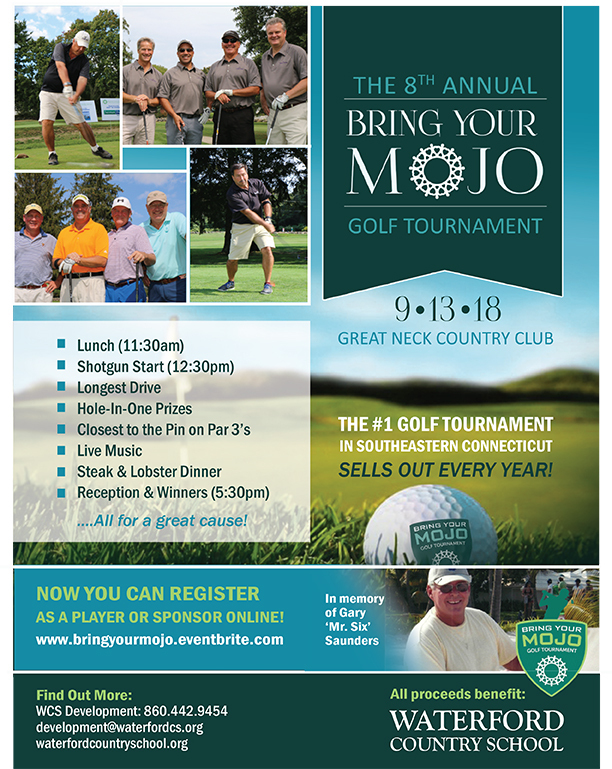 Waterford Country School’s Golf Committee enthusiastically invites you to the 8th Annual “Bring Your Mojo” Golf Tournament on Thursday, Sept. 13th at the Great Neck Country Club in Waterford. This is not your average fundraising tournament! The Bring Your Mojo Golf Tournament has become a SOLD OUT event! Each year there are new surprises as well as enthusiastic additions to the committee. The tournament is held in memory of founding family member, Gary Saunders, who passed away suddenly on Jan. 27, 2011. As a founding family member, Gary believed in Waterford Country School’s mission of doing “Whatever It Takes” to enrich the lives of children and families with specialized needs. Spurred on by Gary’s life and legacy, the Golf Tournament has raised over $390,000 since its inception!!! The funds raised helped Waterford Country School to finish the Otto Graham Gymnasium and fully fund the Gary Saunders Fitness Center inside the gym. Each year Waterford Country School cares for more than 500 children and 250 animals....we couldn't do it without your support! Tournament day check-in begins at 11:30 a.m. with a Shotgun Start at 12:30 p.m. Entrance fees are $166 per player, and include lunch, 18 holes of golf, greens fees, cart fees, as well as a steak and lobster dinner. The annual golf event also features over 50 raffle items. The golf committee is seeking event sponsors, golfers and general supporters. All proceeds will benefit programs and services at Waterford Country School, located in Quaker Hill. Last year, more than 130 golfers participated and raised over $80,000. If you are interested in being a Sponsor or Golfer in the tournament, please contact the Development Office at 860.442.9454 or development@waterfordcs.org.